Bob Dylan in the 80s: Vol. 1: Dylan covers by Built to Spill, Deer Tick, Craig Finn, and others. Was Dylan really terrible in the ’80s—or had we just forgotten how to listen to him? Bob Dylan always keeps on doing the only thing he’s built to do, which is to mulch all incoming data into symbol, rhetoric, jape, and patter. 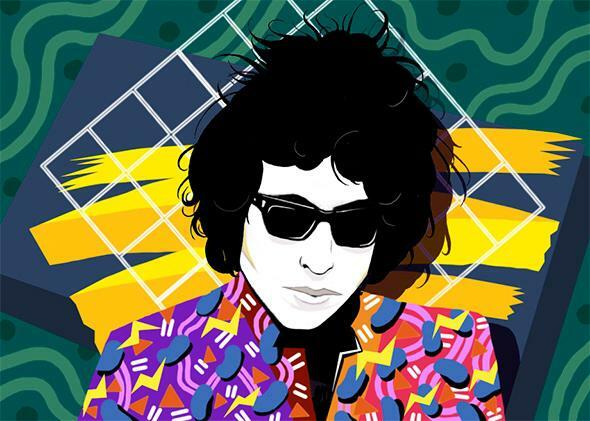 The new tribute album Bob Dylan in the 80s: Vol. 1 comes with an unusually didactic goal, to redeem the “oft-maligned” “wilderness” phase of the singer-songwriter’s career—the lag time between his decade-plus as an unnervingly precise weathervane of American culture and his late-1990s renaissance as a dirty-grandpa sage of mortality, mischief, and musical memory. Executive producers Jesse Lauter and Sean O’Brien want to rescript that story and have enlisted nearly two dozen (counting bonus tracks) hip-ish, young-ish artists, including Deer Tick, Blitzen Trapper, Glen Hansard, Elvis Perkins, and Widespread Panic. Dylanophile novelist Jonathan Lethem adds cred with a lively companion essay. And the team succeeds in its mission, less because of the mostly passable efforts on the record than purely in having posed the question: Does this material deserve all the manure that’s been slopped on it? Like Lethem, I grew up with 1980s Dylan. I’d glommed on to the early topical-folkie albums in my mom’s collection, then fixated on my own acquisitions of the mid-1960s rock milestones, but 1983’s Infidels was the first Dylan record I got to hear as a contemporary event. I paid less mind to Empire Burlesque, Shot of Love, and the next few albums because I was past my classic-rock stage and hunting down indie, cult stuff. It was the face-slapping flash of light that is 2001’s Love and Theft that finally drew me back. But Dylan’s other vaunted late-resurgence albums are actually mixed bags, too. To me the 1980s records sound no less enjoyable alongside them now. It is all the same elusive, imaginative, incorrigible Bob, one of pop’s premiere devils of disguise, more a Madonna than the musical MLK he gets made out to be. (Madge has been a protest singer, too.) He paid for his almost-incomparable streak of youthful inspiration by being driven to outrun his own shadow, into drugs, booze, religion, depression, stylistic quirks, and flagrant commercial betrayals of his purist 1960s savior myth. His Super Bowl car ad this year was just another move in that Seventh Seal chess match against his own legacy. While they’re beatin’ the devil out of a guy who’s wearing a powder-blue wig. As for production, the kick drums and backup vocals are overmagnified, sure, but so were everyone else’s, and they were no less excessive than the strings on some of the 1970s records or the slide-guitar, soft-focus drowsiness of the later Lanois output such as 1997’s Time Out of Mind. All decades have their recording tics, and music lovers should embrace them with good-humored affection. And often Dylan sang better than he does now, too. So if it wasn’t really the writing and performances that explain 1980s Dylan’s outcast status, what was it? I think it was deep cultural structure, on two fronts. Rock began as music rooted in an awkward time of life, pitched to move adolescents and often made by people barely out of their teens. What sustained it and made it dominant was that in addressing teen metamorphosis, that nervy, in-between energy turned out to speak by proxy to larger shifts, such as the post-war schism of tradition and consumerism; nuclear-age existential vertigo; tensions between the sexes or among black, white, and brown in America; and much more. However, rock had trouble assimilating the next big transitional point in most people’s development—the different kind of awkwardness of middle age. As Mick Jagger guessed in 1966, “What a drag it is getting old.” At least for a while. As it’s turned out, rock-era figures are OK at becoming seniors—Dylan, Neil Young, Paul McCartney, Stevie Nicks, David Bowie, and many other icons wear their silvering hair with élan. The painful part came earlier, in the 1980s, when those stars hit their 40s and began to resemble the parents they once seemed born to vex. Young, Joni Mitchell, the Grateful Dead, Bowie, Bruce Springsteen, the Who, Van Morrison, of course Dylan, and even the Clash—almost no Boomer icons escaped being tarred as sellouts and has-beens in the 1980s, often by critics barely a few years younger who expected rock gods to be exempt from time’s scythe. Today, I think, we are beyond that fantasy and project less shame onto aging artists, which makes them less prone to wriggle into self-conscious updates as if they were unflatteringly tight shirts. Beyond rock’s internal growing pains, though, the ’80s were a time of cultural counterrevolution, led by stock brokers, family-values preachers, and the Reagan White House, demanding the total liberation of the market and the re-regulation of private life. Liberal millionaire celebrities didn’t fit on any side: They weren’t down with the agenda, but they were fat cats still. A new globalized order was emerging—the one we’re still living with—and the utopian platitudes of their youth didn’t have much to say about it. Since one thing Dylan’s never had the pipes to do is to sing very prettily, I’m also taken with a couple of the ballads—Dawn Landes and Bonnie Prince Billy’s duet on “Dark Eyes” and My Morning Jacket guitarist Carl Broemel’s rendition of “Death Is Not the End.” Otherwise most of these versions simply seem like rote payments of respect, with the singers sounding pseudo-Dylanish, the way other actors often seem like they’re doing Woody Allen imitations when they’re in his movies. Once the point’s been made, why listen to a bunch of competent knockoffs when I can go back and hear Dylan himself delivering the songs with all his own messy, wrecked, cobwebbed, missing-person, bottomless-pit mystery? At least then they’re part of a suspense drama in progress, not a toast at a commemorative banquet.